Here at Illumine we define Worship as spiritual rest. In Worship, we are reminded of the promises of God and then respond in thanks and praise to those promises. This song does an excellent job of reflecting that idea. In hearing the voice of Jesus, we find our rest. One of the more distinct aspects of this hymn is that it is in two different keys. The first two lines are in G minor, while the last two line are in G major. This change in keys fits particularly well with this text. 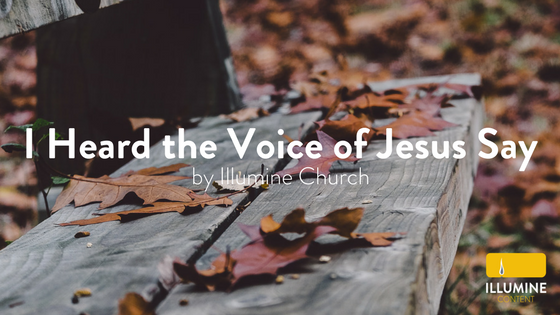 The first half of each verse talks about hearing the voice of Jesus. When we go to God’s Word, it is often because we are looking for comfort in a world that can be exhausting (hence the minor key). The change to a major key then reflects refreshment we receive when we do hear the Word. The arrangement we have included here seeks to accentuate this change as well. There is nothing about the range or the melody that would make this difficult for use by a congregation. It should be pretty easy for most congregations to pick up on (if they aren’t familiar with it already). We find it works particularly well as an opener as a way of focusing people’s hearts on the purpose of worship: to be reminded of (and respond to) the promises of God.